I used to wear insane clothes with no utility, solely because I liked how they looked. Then the pendulum swung to the opposite side and I wore convertible pants. 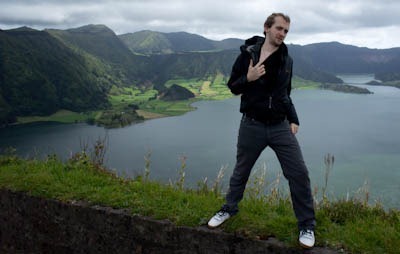 With the Bon Iver epiphany fresh in my mind, I set out on the internet to see if I could find good looking clothes that still retained all of the functionality of my pure-utility wardrobe. This gear update has stuff from all corners, but you'll notice that a lot of it is influenced by this idea. My entire wardrobe can fit in a ziploc bag. I initially pared down just for travel, but even though I have plenty of room in the RV, I keep no additional clothes there. My recommendations are intended for minimalist travelers, but even if you don't leave your local bus system, my suggestions remain the same. There's convenience and joy in simplicity. I swear that I didn't go out looking for high fashion pants, but it turns out that very few companies make wool jeans. Convertible pants were my only clothing item not made out of wool, and the contrast was becoming noticeable. Although I only have two shirts, they simply refused to smell, even if I laundered them only once every couple weeks. My pants, on the other hand, smelled bad much faster. Most wool pants are dress pants, but a few companies make wool jeans. I bought a grey pair from Versace for $90, and was immediately happy with the fit and style of them. I wore them for three weeks straight without washing them, and even close inspection failed to detect any smell at all. I've gotten a handful of compliments on the pants since switching to them, something that never happened in my convertible pants. The cons to these pants are that they don't have zipperable pockets, don't have cargo pockets, and can't be converted to shorts. I've decided to just get separate shorts, which will also make laundry day less awkward for others (I only have one pair of pants, as you may know). Once I bought my jeans, I thought I'd take a stab at getting more fashionable upperwear. I tried a couple shirts from Icebreaker which were surprisingly disappointing, but found a gem on eBay: a 100% cashmere polo shirt. Cashmere is just about the softest and most luxurious material man has ever conceived of, but still has all the magic of wool. That makes some sense, since it comes from goats which are similar to sheep. I'm not sure that this will stand the test of time, but in the short period of time I've owned it, it's consistently resisted odor even better than the already-stellar icebreaker and Smartwool shirts I'm used to. Unfortunately, this shirt appears to be rare. I haven't found anything exactly like it, but you can search eBay for your own size and see if you can find another cashmere shirt. It packs slightly bigger than my other shirt, so I like the idea of having my other shirt be the smaller Smartwool tee. When I first bought my motorcycle I wore my huaraches while riding. I knew that it was a dumb idea, but it took a few days for my new shoes to arrive in the mail. I once stopped at a stop light, only to see a fellow rider to my right pointing at my feet and shaking his head with disapproval. No more! In spite of the name, the Aqua shoes have nothing to do with water, as far as I can tell. They use a very thin sole that transmits the feel of the ground just as the huaraches and five fingers. The toe box is wider than any other toe box I've ever been privy too, leaving me enough room to spread my toes and not hit either side. Somehow this girth doesn't make the shoes look like they're for clowns-- score one for Terra Plana. I'd be willing to bet that there are no more minimalist socks than these bad ponies. 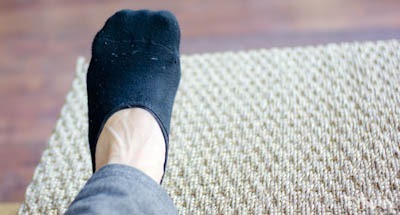 Smartwool socks have always been my favorite socks, almost good enough to make me like wearing shoes. These are just as comfy and functional as other Smartwool socks, but they take up only half the space as others and don't show above low-top shoes. Stylish. No warnings or caveats for these socks, although I wouldn't mind them coming in other colors as well as black. Icebreaker still makes the best underwear. They've updated their line to be even smaller and include crazier colors, and I'm happy about that. I don't watch NASCAR and I don't have a 1994 Honda Civic, which makes me an unusual candidate to own anything made of carbon fiber. But if there's one way to sell me on a product, it's to highlight how it makes travel better. 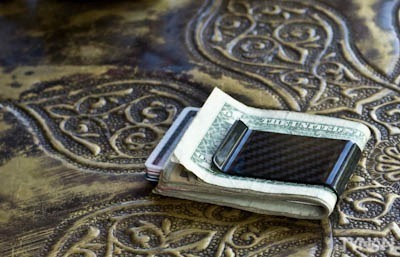 Carbon Fiber Designs points out that since the money clip is made out of carbon fiber, it doesn't trip metal detectors. Ahh... good point. Before the money clip I used a Mighty Wallet which is a cool idea and a mediocre wallet. When loaded with stuff it starts looking pretty shabby and I didn't find it organized well enough to justify the (admittedly minimal) bulk. (Note: Todd hates my money clip and loves his Mighty Wallet). I don't remember why I made my way to the sales page of the carbon fiber money clip, but two points sold me: the aforementioned inability to trip metal detectors, and the fact that it could hold a lot of stuff and still spring back to hold a single bill. I've only had the clip for a week or two, but I already love it. I put my cards in the middle and taco them with the bills. What could possibly be a more minimalist wallet than this? It holds everything very well, weighs almost nothing, and is generally a pleasure to use. Unlike some wallets, it can hold any size foreign currency. Truly a product that exceeded my expectations. Folding sunglasses are the best things to happen to my eyes since PRK laser surgery. They're far heavier than the Maui Jim Titanium sunglasses I left for Life Nomadic 1 with, but we're talking about an ounce or two at most. The overriding utility in folding sunglasses is that they're easy to carry with you at all times. As I write this, my Persol 714s are in my right pocket, barely noticeable. The sun has to be extraordinarily bright for me to dig through my backpack to find sunglasses, but when they're right in my pocket, they get used all the time. 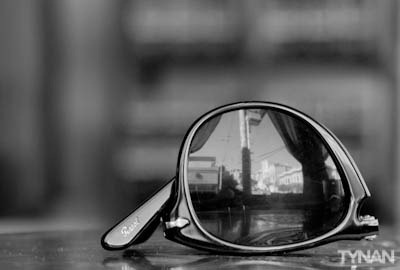 There are only two brands that make folding polarized sunglasses, RayBan and Persol. Both are about the same size when folded, so the model you choose can be based on style. The Persols seem to be a bit higher quality, using nice solid metal hinges, but they're also more expensive. I switched from the RayBans to Persols pretty much exclusively because everyone in San Francisco has Wayfarers. Todd has been the major driving force in shrinking backpacks since day one. I was ready to get on the plane for Life Nomadic with a maximum carry-on sized backpack. Todd suggested the Deuter Futura 28, which I thought was insanely small, and it ended up working out well. Since then we've both been trialing other bags, and he struck gold with this one. I'm a logical person. I don't believe in superstition. I think science can explain everything. 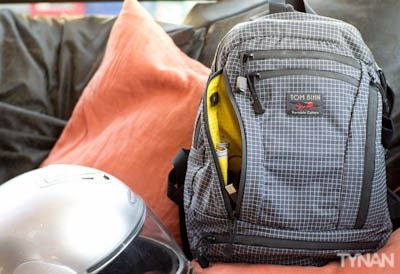 All that said, I have no idea how so much stuff can fit into the Tom Bihn Synapse. My jackets stuff into the bottom pocket, my kindle and camera go in the middle pocket, chargers and cables fill up the side pockets, my laptop and clothes fill up half of the main compartment, and the other half stays empty. The organization of this bag is second to none, as is the build quality. I bought the Dyneema bag, which is half a pound lighter and still extremely durable. The straps are comfy, and the zippers are water resistant. The real beauty of the bag is its size. It's only nineteen liters, just two-thirds of the already small Deuter 28. It gives the impression that you're just out for the day and maybe brought a couple books and a sweatshirt. On sight alone, it's impossible to conceive that someone can comfortable live out of such a small bag. Let's face it-- big backpacks look ridiculous. Carrying a metal frame backpack on your back and a daypack on your front is the visual equivalent of walking around with an 80's style boombox over your shoulder. It's conspicuous and ensures that you won't be treated like a local ever. I now consider the Deuter 28 to be at the large end of the acceptable spectrum. When it's fully loaded it looks like you're traveling, albeit traveling light. The Synapse never looks like you're traveling. It fits easily under every airline seat, doesn't bump into people on packed trains, and is easy to jog in. I've gone through five backpacks since the Deuter, and this is the first one that has no drawbacks. 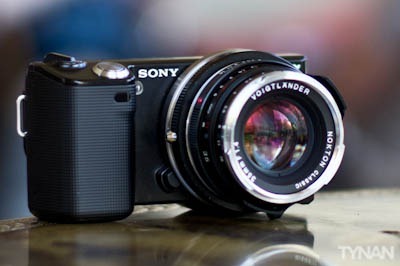 A few months back, I wrote about the ultimate camera setup, the Sony NEX-5 coupled with the 50mm/1.1 lens by Nokton. However, after lugging that lens around for a while, I found two things: 1. It's a bit more telephoto than I'd prefer, and 2. it's heavy and large, which sometimes discourages me from carrying it with me. I found myself using the kit 16mm/2.8 lens, which just doesn't have the same magic to it. Luckily for me, Nokton came out with another lens, the 35mm/1.4, which is very similar to the 40mm/1.4 I used to shoot with my old digital rangefinder. The old 50mm weighs half a pound more than the 35mm, and is 2.5 times longer. I prefer the wider view of the 35mm, and the 2 foot vs. 3 foot minimum focal distance corrects one of my few real gripes with the 50mm. My Coolermaster power adapter randomly died a couple weeks into a recent 6 week trip, forcing me to "buddy breathe" with my friend's power adapter. 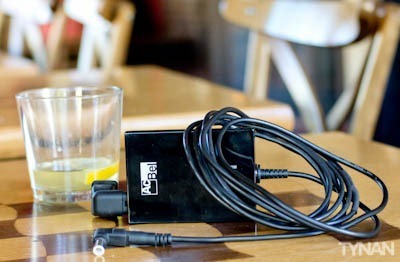 I replaced the Coolermaster unit with one from ACBel, which is the smallest power adapter on the market today. It works perfectly, has the same smart tip connection that the Coolermaster has, and is a bit smaller. To make the charger even smaller and lighter, I replaced the leading power cord from the wall to computer with a rigid right angle adapter from iGo, and then spliced a much longer power cord from the box to the computer. A couple years ago I won an old version of Eye-Fi in a contest. The gist of it is that it's an SD card with a built in WiFi chip, so that it can upload your files directly from the camera. It seemed like a good idea, but since it didn't support RAW files, it remained unopened in my drawer. For no good reason at all, I decided to try it at 2am one night. I liked it so much that I drove directly to Best Buy the next morning and bought the pro version, which has an 8GB capacity and supports RAW files. It takes a bit of configuring for optimal use, but once it's all set up, the Eye-Fi is magic. I snap a photo on my NEX-5 (which has special Eye-Fi support built in) and less than thirty seconds later, the photo is imported into Lightroom. If you shoot jpegs, it's exponentially faster. There are a lot of other features it supports, all of which were initially exciting to me, but in the end I found that I just stuck to the core functionality of wirelessly transferring photos. It's not fast enough for HD video recording, so you still need a separate card for that, but otherwise it's a great product. The Shure's have managed to supplant my trusty Etymotic ER-4s, which finally died after over ten years of service. Where the ER-4s had a single high quality driver in each ear, the Shures have three: two subwoofers and one mid/tweeter. The clarity and sonic quality equals the Etymotics, but the bass response is considerably better, as could be expected. It's the small things that count sometimes, and while I'm blown away by the sound quality, what really made me fall in love with the SE530s is the super short cord-- just long enough to go from my laptop to my ears (they come with an extension cable for the iPod-in-the-pocket experience). Don't buy the newer SE535 model. They have the exact same internals, a slightly smaller case, and a longer cable. That would be a wash if it wasn't for the fact that they cost over a hundred dollars more. You'll have to search eBay for these since they're discontinued. Not much of substance is gone from my pack since the last revision. Mostly it's been a process of miniaturizing rather than omission. The one thing I've finally admitted that I don't need is my Dovo travel badger brush. It's funny how my original "minimalist" packing list now seems excessive. When we first started, my attitude was that I'd get a reasonably small backpack, and then get creative filling it to the brim with as much as possible. Now, after years of walking around with my backpack everywhere, I've shifted my focus towards making it as lights as possible. As I mentioned before, my pack now has a lot of empty space in it. There's no gear that I'm coveting these days, and not much improvement amongst my current gear that I'm hoping for. I wouldn't mind it if my laptop and camera shrunk a bit, but both are tiny as-is. For years I've been hearing about custom fit headphone-- how they're much more comfortable, have better bass, and block outside sound better. JH Audio has put me on the review list for their top of the line JH16s, a $1300 set of earphones that I was actually considering buying outright just to see if they're as amazing as all the audiophiles say. So stay tuned for a travelophile's review of them once they get to me on the list. I'm sure that in 2012 I'll make some big changes to the gear list, but right now I can't imagine what they'll be. Life is good for minimalist travelers these days. In case you don't know, I wrote an awesome book about minimalist nomadic travel called Life Nomadic. Check it. A deal: if this post is tweeted / posted on blogs at least 100 times, I'll post two posts per week minimum for the rest of the year. actually, there is one thing better on the SE535 Headphones compared to the SE530, and you will find out about it soon: the cable is replaceable. I always admired the Shure 5-Series headphones, and use them on stage as well, but i only bought them when the model with the replaceable cables came out, due to the fact that you don't have to buy new headphones if they break. Hi Tynan! Where did you find the wool jeans? I tried googling but can not find anything. Tynan, do you still like the Aqua shoes? BTW, I bought the money clip and love it. I switched out the aqua shoes for a pair of Earthrunner sandals and Vibram leather Bormio shoes, which I use for motorcycling. I just got a motorcycle (highly influenced by you!) & am looking for minimalist footwear for riding. Since the Vibram Bormio is discontinued, do you know of any other alternatives for riding? Tynan, After reading through your book life nomadic, And your blog posts on minimalism, it pretty much inspired me to do a similar idea. I have yet to sell everything I don't need yet. But in starting it I have it to the point where I can pack what I really need into a 14.9 liter backpack. I did think that 28 liters was too much, And I never needed a lot of space for tech. But it is funny to see peoples reactions to a lot of it. Thanks for inspiring me to make a good positive change in my life. And stoked to see the 2012 packing list. When are you posting the 2012 update? No immediate plans to do so, but I will at some point. New camera and computer are on the horizon, so that might be a good time to do it. Thank you for posting why you ditched the Ortlieb 22 instead of just letting unknown reasons hang there. I found that info helpful. Do you ever find it a problem that your Synapse isn't waterproof? I normally hate socks. Before smartwool I had only 4 pair, which I wore only when exercising. 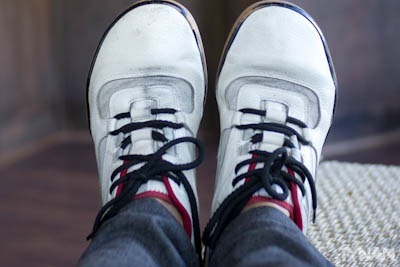 My main criteria when buying shoes (and I have gone through phases where I have bought lots of shoes), is to buy shoes that don't require socks. So if you can tolerate the thought of socks, you're already a step ahead of me. For some reason, I like textiles more than your average 25 year old. I think that wool is an amazing material and I have read about it extensively. It is an excellent insulator, which means that it keeps you cool in the summer and warm in the winter. The fibers are very strong, so it can't be flattened over time like cotton (that's why wool rugs are so popular). It has natural oils that repel dirt. It wicks away moisture and can hold up to 1/3 of its weight in water before feeling wet. It even absorbs odors. When I heard about Smartwool socks, I wasn't excited. I had a pair of wool socks before, but they were far too itchy and thick for me. I read that these socks were used on Everest, though, and that they weren't itchy. I had to try them for myself.